Is your child having a dinosaur themed birthday party? Dinosaur Bite Birthday Numbers Applique includes numbers 0-9 and features T-Rex. Font shown (the name Easton) is Payphone Embroidery Font and Dinosaur Track 2 Minis (underneath the letter "o"), both available as a separate purchase. 4x4: 3.87 x 3.85 inches. SC: avg: 7771. 5x7: 5.00 x 5.03 inches. SC: avg. 10,490. 6x10: 6.00 x 6.00 inches. SC: avg. 12,439. 8x8: 7.82 x 7.69 inches. SC: avg. 16,812. Is your child having a dinosaur themed birthday party? Dinosaur Bite Birthday Numbers Applique includes numbers 0-9 and features T-Rex. Font shown (the name Easton) is Payphone Embroidery Font and Dinosaur Track 2 Minis (underneath the letter "o"), both available as a separate purchase. 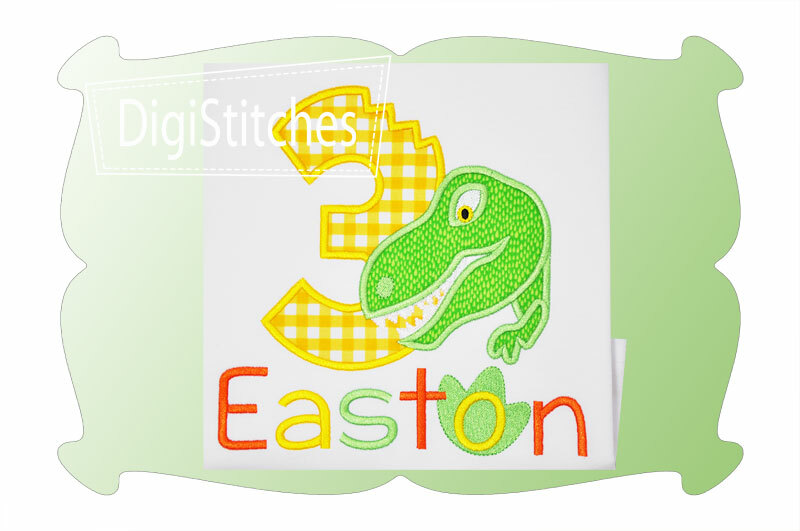 Dinosaur Bite Birthday Numbers Applique comes in 4 sizes. All sizes included with your purchase!